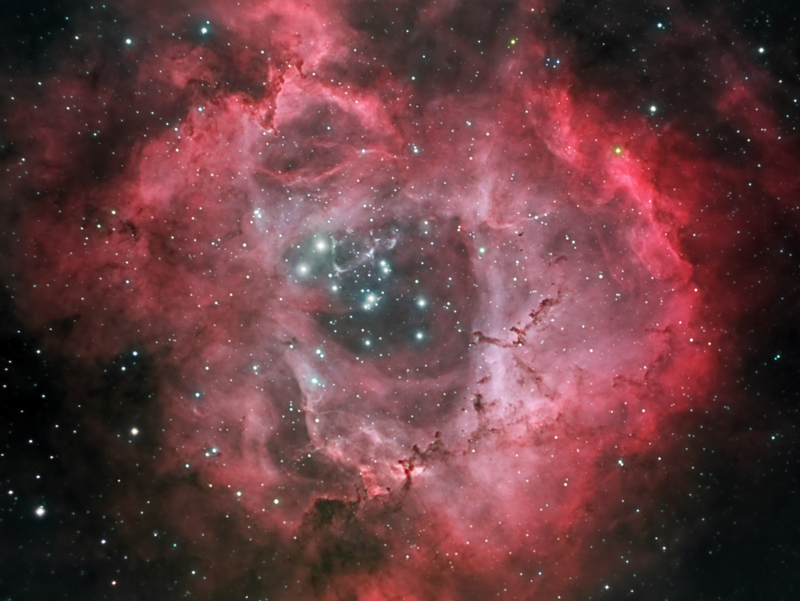 The Rosette Nebula (also known as Caldwell 49) is a large, spherical, H II region located near one end of a giant molecular cloud in the Monoceros region of the Milky Way Galaxy. The open cluster NGC 2244 (Caldwell 50) is closely associated with the nebulosity, the stars of the cluster having been formed from the nebula's matter. Altogether, approximately 2,500 young stars lie in this star-forming complex, including the massive O-type stars HD 46223 and HD 46150, which are primarily responsible for blowing the ionized bubble. Most of the ongoing star-formation activity is occurring in the dense molecular cloud to the south east of the bubble.